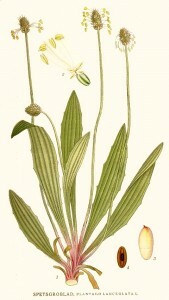 The Plantain leaf has been used as a snakebite remedy, to prevent uterine bleeding after childbirth and dressing wounds on the battlefield. The plantain leaf we are talking about here is not the same as banana-like vegetable of the same name. Broadleaf plantain, Healing Blade, Soldiers Herb, Roadweed, White Man's Foot, Lanceleaf plantain and Ribwort are other common names but if you are looking at the ingredients list of a natural skin care product you may find one of its botanical names plantago lanceolata or plantago major. Herbalists have been using the plantain leaf to remedy inflamed skin, dermatitis, insect bites and eczema for a long time. It's major constituents give plantain a mild anti-inflammatory, antimicrobial and antihemorrhagic effect. It is also a powerful coagulant. By crushing the leaves and applying them topically, plantain soothes and calms the problem area. Plantago Major contains allantoin, which helps cell renewal (see blog on allantoin). The Nourishing Cream by Latvian organic beauty specialists Madara is one skin care product that contains plantain leaf as a biologically active ingredient to soften and soothe skin, especially to the dryer parts of the body - elbows, knees, feet and hands.